Let’s meet Alphi the smart puppy! Watch this super cute and playful puppy, stand on the back of her legs and turn around cheerfully when you wiggle the bone-shaped rattle. 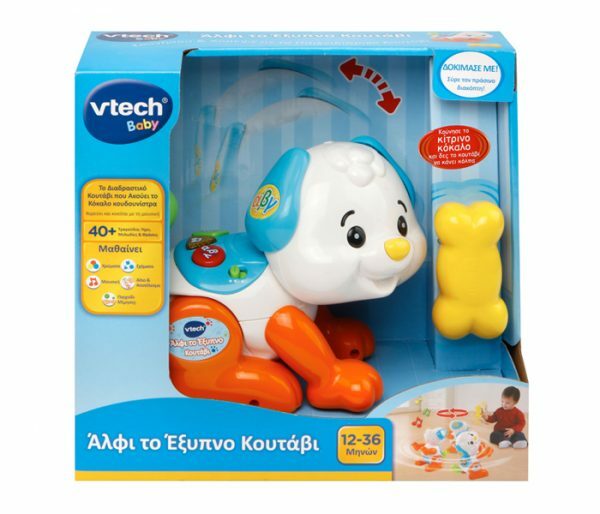 On the back of the puppy there are three different “shape” buttons that will teach the child in GREEK the shapes, colors, letters of the alphabet (α, β, γ) and the numbers (1,2,3). The puppy promotes motor skills, helps develop the child’s imagination and understanding the cause and effect through interaction with the bone-shaped rattle and the buttons. This happy puppy also plays 2 joyful songs to sing with your little one as well as 10 pleasant melodies and more than 30 joyful sounds. The light button flashes in combination with sounds and music!